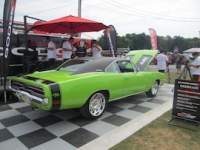 Who wants to Megasquirt, full sequential fuel/ spark a 68 charger! This Guy!! 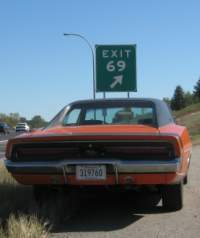 DodgeCharger.com Forum > Discussion Boards > Charger Discussion (Moderators: Chryco Psycho, hemigeno, firefighter3931, Charger-Bodie) > Who wants to Megasquirt, full sequential fuel/ spark a 68 charger! This Guy!! I'm not broke, I'm just badly bent. and I am going to fuel inject it with both sequencing spark and fuel. the plan is to build a Megasquirt MS3X ECU, and use LQ9 Truck coil packs for spark. Reluctor wheel on crank, with junkyard ford sensor. I will convert my current distributor to be the CPS for now. Plans down the road are to build a new housing/plug in house that accepts a jeep CPS so I dont have a huge distributor body for a CPS! So far I have built a Jim-Stim for practice. This little guy simulates my engine as if it was in the car. I will be able to bench test my ECU and do initial tuning with this little device. Next up is the ECU, and the continuation of parts sourcing from junkyards and such! JUNKTRAVELER: all I've seen in this thread is a bunch of bullies and 3 guys that actually give a crap. 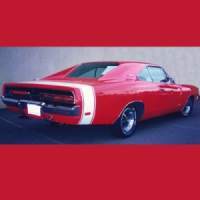 Re: Who wants to Megasquirt, full sequential fuel/ spark a 68 charger! This Guy!! The Fuse/relay board for the injectors, and fuel pump and such. This will be the under hood component where all my sensors and power wires will terminate. This in turn will go via DB-37 connector to the Megasquirt ECU that I will keep housed in the car. The yellow wires are jumpers for the Idle Air Control valve stepper motor. Something to take note about the Megasquirt system. You will notice the SD card slot. This is a logging card that can be removed and taken to a computer to view whatever log you have setup in the tuning. This was the ultimate feature that sold me on Megasquirt! Also the USB tuning function, and the "AutoTune" that is found in Tuner Studio. I got the board tested, and hooked up to tuner studio. So far so good!!! if anyone is on the fence about this, the documentation is so good, that you should not hesitate. This system destroys the other offerings on the market at a much smaller cost! I still need to install the "X" expansion that will give me 8 channels of spark control. It's a simple ad on board. Spent an hour or so in the junkyard today and scored my LQ9 Truck coils! These are the D-585 coils that people are using as hop ups on the LS2's I guess. I don't know why the truck coils are that much better, but they are an in demand item. Mine came off of a 2003 Yukon. These are a simple low value trigger wire hookup that is wired to each coil from the MS3X ECU. They already have an ignitor in them. I plan to fabricate studs on my valve covers to hold the stock brackets and coils. Total price for these, and a VR crank sensor off of a Ford tourus was $62. I cleaned up the bottm set of coils, and they look brand new. If you are looking for the specific truck coils, you will want to find the coils with the heat sink on the back, that is the distinguishing feature. I recieved my fuel rails, and my Jeep 4.0 Cam sensor. More on that in a bit. 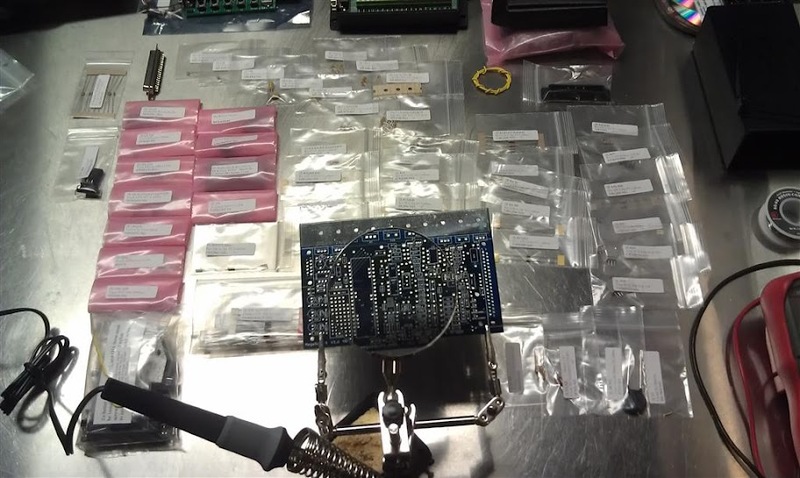 For now, here is a video that goes over exactly what the hell I am building here as far as electronics. This is an amazing package for the money, and the more I learn about it, the more excited I get. And now the cam sensor. The way these systems work, is they need Crank trigger, and Cam trigger to function correctly in full sequential. 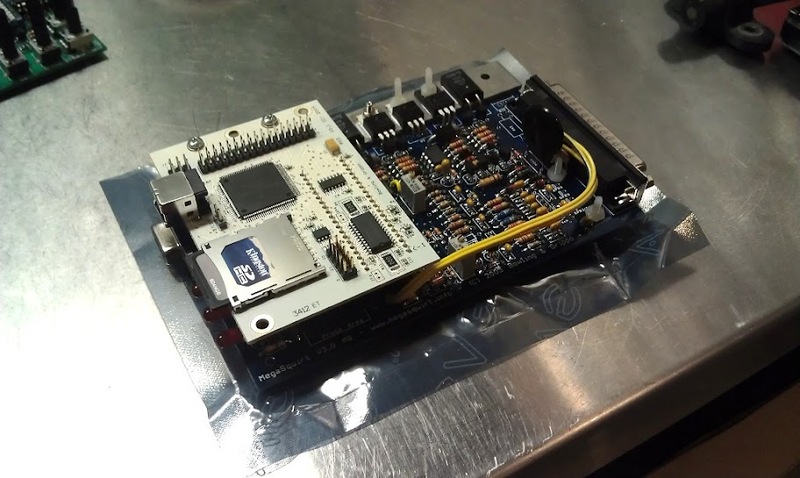 Some guys just modify the stock distributor and use the existing VR sensor on board to give Cam signal to the ECU. The ECU is looking for a basic ON/OFF signal in order to know where the engine is in relation to Intake stroke vs Exhaust. Not wanting a gutted distributor poking out of my engine I started looking at other options. I think I have found a good solution. 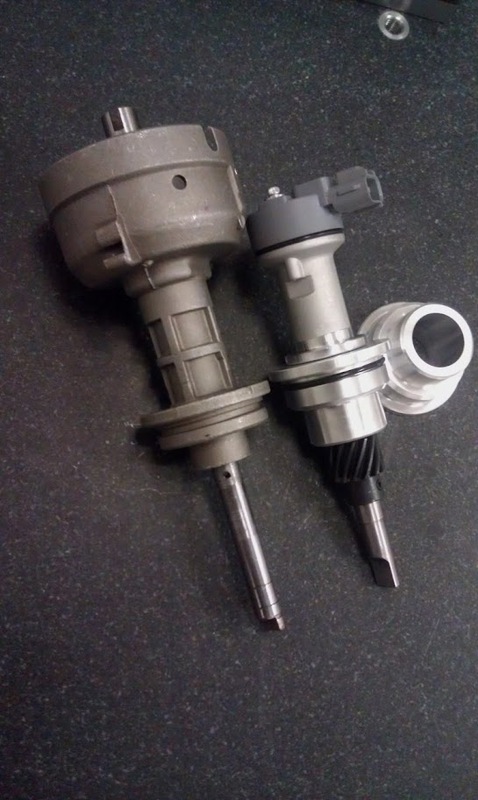 Here is a stock distributor next to a Jeep Cam sync shaft, and sensor. You will notice that the drive key-way on the bottom of both units is exactly the same! My plan is to make a bushing that simulates the stock distributor, and bushes down to hold the jeep sensor in place. This will literally be a drop in ready to go package with a simple lathe project to make it work. The Jeep CPS was $40 and that includes the shaft and body. The gear that is on it will simply float on that shaft, and just retain the guts. This will keep me in my line of thought that should i need a sensor on the road, it's a common part, and easy to get at any auto parts store! 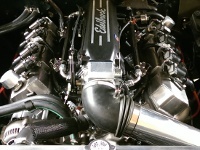 Received the Edelbrock Pro Flo XT Manifold today, and installed the fuel rails, and take off raptor 6.2 injectors. 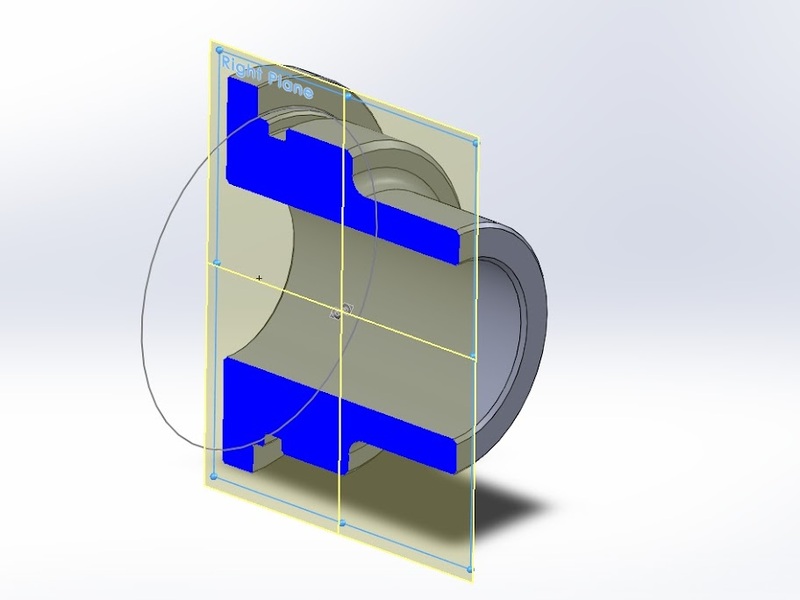 Using Solidworks I also modeled the simple adapter bushing for the distributor hole in order to retain the Jeep CPS in place of the stock distributor. As soon as jobs clear the lathe, I will spin out a couple for test fit. This will make the Jeep CPS a drop in CPS for a 440 big block. Total $ into the project so far is $1592... I still need to finish my fuel system, and purchase or source a throttle body, and a few sensors. I can still sell my new carb, and intake off the car to get some cash back. Total for the project should be well under $2000 for a full fuel spark sequential setup that is fully tunable per cylinder. It will be a much much nicer setup then what is offered by FAST, MSD or the likes for this price range. Spun up the TL-2 today, and made my bushing for the Jeep CPS. Looks like it will work perfect. This is a great, and easy way to get cam signal to the engine management system. And the best part about it, is I can stop at any parts store and replace the CPS as a drop in unit for just over $30 should things go bad on the road!!! 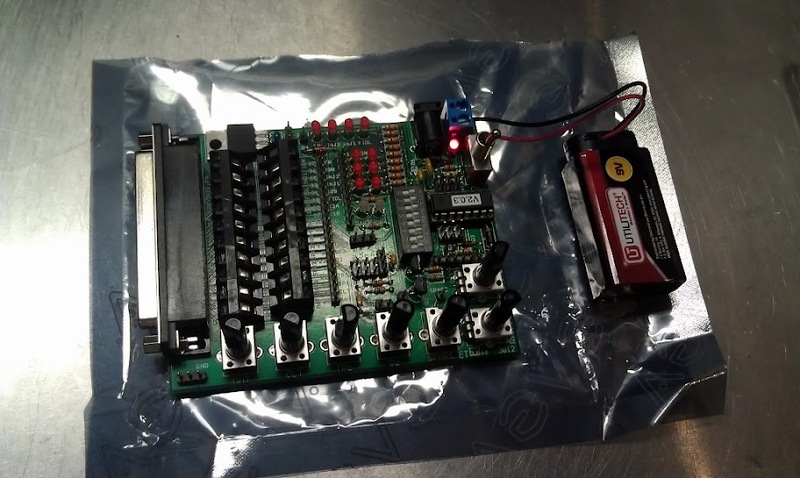 I made two of them because I have another person who is going to try it out on a GM management system programmed to run a 440 as well. My only concerns are that I gave it a .001 slip fit, and that could be a problem should the CPS vendor not hold tolerance. We will see I guess. Take note that the gear on the CPS will just float inside the block on the shaft. It's simply there to retain the guts of the CPS, and that's it. I made it out of 7075 we had floating around for Billet Hand guards. Now you get a perfect example side by side of what I am accomplishing with this bushing. A little more junkyard shopping today! I got all my pigtails for my Raptor injectors off a ford econo-line van. I picked up a few GM MAT sensors from a couple Saturns. And I also snagged this 36-1 Crank trigger wheel off a ford excursion. The pulley is the stock 440 Mopar pulley. I will machine the center out of the trigger wheel, turn a small step in my stock pulley and slip the trigger wheel in place. I will then TIG weld it to the pulley. Total price today out the door for everything is $16! 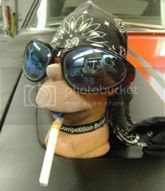 I also ordered a new TPS, and AIT from Rockauto, I will source the pigtails from the junkyard. Ok, the entire thread is now moved over here, I will call it home! Hope you guys don't mind the tech overload, and all the pictures. Me have Holley Double Pumper. But seriously.... looks like resourceful fun. Pure hot rodding. That is whats so fun about Megasquirt... 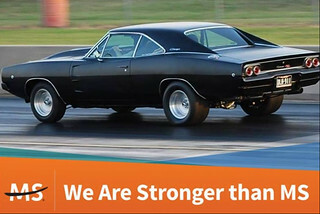 It truly is hot-rodding for the modern age. it fits right in with the Jeeping I do, and the fact that getting it to work better then you can buy it for, and using stuff found in junkyards makes it feel like I did it myself. If the Edelbrock Manifold wasn't such a good looking piece, I may have tried my hand at fabbing my own. Pulley with a wheel on it!!! got pics of it? May save me some time! Alright, I have no idea what all you're saying but that's okay....how much to build me one of those man, I want efi! Heard good things about Megasquirt. Words were written, I understood some of them. This obviously is an engineering exercise for you, I'm guessing you wanted maximum tweakability/tunability. The setup is not exactly 'dirt cheap', so budget isn't primary. Can you give a little bit of an explanation about what each system you looked into had as pros/cons? FAST was $2300 and I would get everything I needed, but it would be a closed off system I could only make small changes. I would also only have a TBI setup, no spark control. Meh... I know its good stuff. but I wanted more. FAST offers The better setup, that does sequential, but it's expensive as all getout. Holley and the likes Same as above. The Edelbrock Pr-Flo XT System was more what I was after, but again, it's tunability was Meh... and it was $3600!!! The more I started reading about it, the better I felt about it. It would do Full sequential fuel, and spark, accept Idle air controls, Two nitrous stages, Launch control, Full logging to include my own voice recorded over the log if I wanted it. I can set it up to tune it via bluetooth off of my phone if I want. It fully destroys anything else out there in my mind. You just have to take the time to read the forums, and the documentation. Honestly after a week of research, the EFI stuff is silly simple. It's spark, fuel, a cam sensor, crank sensor, and a map sensor. I can also let the Megasquirt "Self Learn" through tuner studio if I want to. I won't be more than $1500 into this whole setup after I sell my carb and intake. Also keep in mind, I went with the full boat, best ECU you can build from Megasquirt. Had I gone with an MS2, and done a batch fire system instead of the full sequential, It would have been cheaper. Me taking the time to source sensors and such is what makes the system so cheap. But honestly all this stuff is out there sitting in junkyards for the taking. Interesting responce.....a lot of your reasons mirror mine. Being able to self tune to changes in the driveline is second from the top of the list. Your take on relibility? Top of the list for me. I've only talked to a couple of people so far....they have not had it long enough to really know yet. If this is true sequential so no fuel goes to waste then that should be as efficient as a 440 is ever going to get. And at that price I'll take it! Thanks for documenting this! The only EFI that I'm currently fooling around with is on a small block and it doesn't need any (many at least) modifications. I'm on the fence about using MS as a controller though as I really don't need any of the advanced features at this point. If/when I do concentrate on a big block the MS system will probably move to the top of the list. "Liberalism is a disease that attacks one's ability to understand logic. Extreme manifestations include the willingness to continue down a path of self destruction, based solely on a delusional belief in a failed ideology." And I thought I had my hands full with a 6-pack. Very nice work. You have mad silly skills.